It bugs me when people don't think as highly of minimalism as a form of expression; admittedly I'm a little obsessed with the idea, but paperfolders in particular should know better. 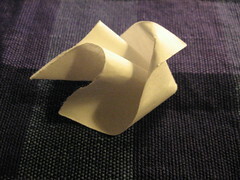 Origami is, essentially, an art of abstraction; we must choose which details to include, and which to leave out. Paper cannot render the world around us in perfect color and detail, and we should not necessarily expect it to. Not to be contrite, but sometimes less really is more. We should use subtle folds and careful sculpting to bring out the character of the subect, something many complex folders often forget about. That is not to say that anybody that folds something minimal has automatically created an artistic statement; quite on the contrary, most simple models I've seen are misproportioned, awkward, and vague about what the intended subject is. If the statement is effective enough, though, it can be more powerful than a more complex one. Think about it: in a drawing class, we are told to put less detail into the background than the subject, and to keep any distracting elements out of the composition, unless they have a purpose. This is because the subject carries any meaning or connotation the artist wishes to invoke. This is equally valid in sculptural art; we take out excessive detail to let the character of the piece come through. While detail is good when used effectively, it often distracts from the subject and obscures the elegance of the model. Another thing that I have heard thrown around a lot is that a minimalist or easy piece is folded by a person who is lazy or not technically advanced enough to do any better. But I would disagree; instead these models require more from a designer and/or folder, because the subtle nuances of the character are that much harder to bring out when you're working with such a limited set of tools, which is in a sense just a projection off of the rules we already impose upon ourselves: no cuts, no glue, and (most of the time) folding from a square. very long time no c! may i know what is decreeping?